It’s 1870 and Amy Watts needs to get as far away from New York City as possible. 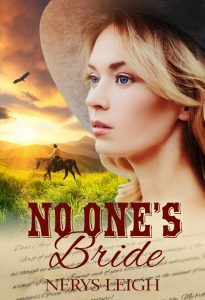 Her only hope is to answer postmaster Adam Emerson’s advertisement for a mail order bride, but the last thing Amy wants is a husband. When her plan to trick Adam into paying her way across the country goes awry, her guilty conscience compels her to stay in the small Californian town of Green Hill Creek to find a way to repay him the cost of the train ticket before she moves on. The trouble is, she’s completely unprepared for the effect of his kindness, charm, wit, and ridiculously blue eyes. As her dream of a new life in San Francisco begins to falter and her past catches up with her, can Amy hold onto the one thing she never thought she’d want but now can’t bear to lose?